Note: The information in the article is somewhat dated, check the Cluster Plumbing links for more updated tools. Welcome to Cluster Monkey and the Cluster administration column. The theme of this column is clusters from a system administration point of view. Sure, you can create all kinds of fantastic applications on your cluster, but that doesn't do anyone any good unless you can log in! The cluster administrator has some unique challenges, that your normal everyday system administrator doesn't face. For starters, you are likely to be responsible for many more machines. While you may have one cluster, that cluster may consist of hundreds of individual nodes. From a hardware perspective, maintaining 512 cluster nodes is just about as hard as maintaining 512 individual workstations. Nothing about putting machines in a cluster makes disks, fans, or power supplies less likely to burn out. 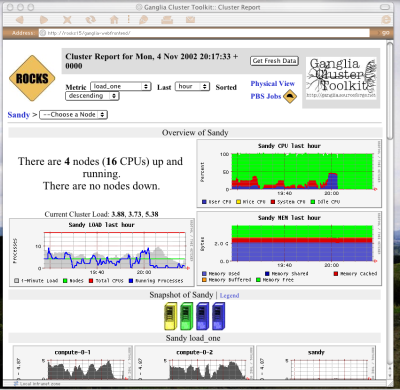 From the software perspective, though, running a 512 node cluster can be a lot different than running 512 workstations. There are really two facets to cluster administration, things you must do on a per-node basis, like fixing disk drives, and things you must do only once on a per-cluster basis, such as (hopefully) adding new users. The goal of your cluster distribution or management software, and your goal as an administrator, is to turn as many per-node administration tasks into per-cluster tasks as possible. Over the last few years, cluster administrators have responded to these challenges and become an increasingly sophisticated bunch. However, for every administrator out there trying to tweak the last few bits per second out of their infiniband drivers, there seem to be several (at least judging by the traffic on the Beowulf mailing list) who have a big pile of machines and are wondering what they can do with them. So, in this column, we're going to start in the beginning, with what kind of distribution you want to use for your cluster, and work our way forward through all the topics cluster administrators care about. In months ahead, we'll plow through a few of the more mundane tasks like installation and updating packages, move through some of the more cluster specific tasks like monitoring, queuing and scheduling, and file system alternatives, then move on to the more advanced world of dealing with faults and tuning network performance. Along the way, we'll solicit the opinions and best practices of many of the top cluster administrators around the country. Perhaps the most common way to build clusters, especially small ones, is by simply using a standard Linux distribution, such as Red Hat, Fedora, SuSE, or Debian. Many people are familiar with these distributions, so using them is a way too "ease into" clustering. 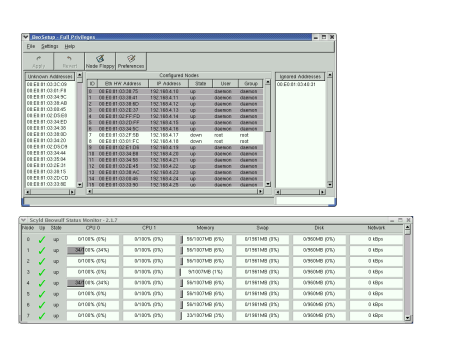 Most distributions come with some version of message passing software included, so almost no extra effort is needed to get up and running initially. Of course, this is just about the worst case from an administration point of view; not only must you replicate the full work to install a single machine on each node of your cluster, you must repeat every administrative task on each node in your cluster. Naturally, solutions like this don't live long in a community of hackers, so many tools to make things easier quickly started appearing. Solutions to the install problem emerged in the broader market, where single administrators were having to manage hundreds of headless systems for server applications, as well as for clustering. The addition of PXE boot capabilities to the BIOS of most motherboards, the widespread use of DHCP, and the creation of network install tools like Red Hat's kickstart made it possible to rapidly do large numbers of identical installs. 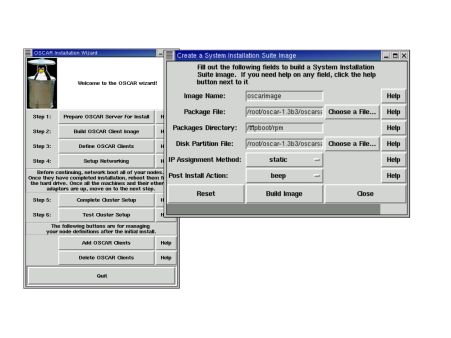 These tools were a boon for cluster installation, as described in another column. But once the initial installation was completed, none of these tools helped with day-to-day administration. This void was quickly filled by both vendors and the open source community, with lots of scripts designed to handle common administrative tasks. The scripts grew in complexity, and custom GUIs soon appeared. Many open source tools for handling one aspect or another of system administration can now be found on sourceforge, and virtually every cluster vendor now distributes there own custom suite of management tools. Many of the vendor specific suites continue to grow and have taken on some of the characteristics of the more sophisticated systems discussed below. As clusters got larger, and the number of software packages used on them increased. The use of a standard distribution plus a collection of scripts became less practical. Some people realized that keeping track of the configuration of the software on cluster nodes, and the nodes themselves, would eventually require a more sophisticated approach. The first of the true cluster distributions began to appear. These distributions featured all the aspects of a normal linux distributions, but were cluster-aware; they featured install programs specifically tailored to clusters, database systems for maintaining the configuration of your cluster, batch queuing systems, cluster monitoring software, and other cluster specific features. The two most well-known and successful of these cluster distributions are OSCAR and ROCKS. The OSCAR, or Open Source Cluster Administration Resource project was started at the DOE's Oak Ridge National Labs, and OSCAR and it's variants are now maintained by a consortium of folks known as the Open Cluster Group, which includes the original developers from Oak Ridge as well as a number of contributors from other labs and universities. OSCAR is designed for clusters from the ground up. OSCAR provides a cluster-aware install tool (shown in Figure One), which handles the installation of packages on your nodes, as well as setup of users, accounts, etc. In addition to all the standard packages (at this time, OSCAR by default installs packages from RedHat 7.3, though Mandrake support is also available, and the latest betas support newer versions), OSCAR also provides a number of cluster-related packages designed specifically to work with OSCAR. Notable among these from the administrators perspective are C3 and Env-Switcher. C3 is the Cluster Command & Control suite, which provides a rich set of commands for managing files, running programs, or executing commands across all or some of the nodes in your cluster. Env-Switcher allows you to install multiple versions of the same tool, and easily switch the default version on all nodes.. This can be extremely useful, for, say switching between compiler versions or different implementations of MPI. We'll talk more about both these tools in a later column. The OSCAR project has spawned several child distributions focusing on particular segments of the cluster world, such as thin OSCAR, for diskless cluster nodes, and OSCAR-HA (high availability) with fail over capability.